If you want to get the best mortgage rate available to you, many consumer finance experts recommend that you compare mortgage rates from competing mortgage lenders. And completing a form on a website dedicated to mortgage shopping is probably the easiest way to do this. Unless you like spending the day on the phone or driving from lender to lender. The reason for using online resources like The Mortgage Reports to compare mortgage offers is that mortgage products come and go without notice. And mortgage interest rates are tied to financial markets. Like stocks and bonds, mortgage-backed securities pricing changes all day long, and that can cause mortgage pricing to do the same. The advantages of using comparison sites over looking at advertised rates are that the sites generate your quotes in real time, and they incorporate your personal characteristics into the quote. On the other hand, advertised rates usually come with disclaimers stating that the rate applies only to perfect applicants with 20 percent down. And are subject to change. At The Mortgage Reports, we do not ask for personally identifying information like your social security number. In fact, most of the questions are just check-boxes or buttons to click, and it takes less than a minute to answer them. Finally, you’ll get a request for the phone number you’d like lenders to use to contact you with offers. Those licensed in your state and specializing in the type of financing you’re looking for can contact you directly. You’ll have the opportunity to ask them questions about the best loan for you. They will ask you about your goals and needs. Alternatively, you can click directly on links to lenders to see their rates and programs. However, understand that these won’t necessarily be tailored to your specific requirements and that you may have to answer additional questions to get a quote. 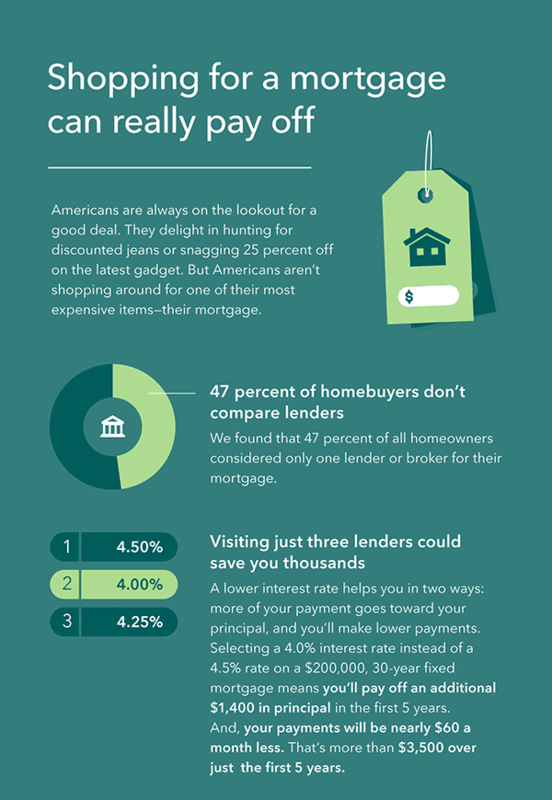 To compare among those lenders, you’ll have to go through that process with each one. Whether you want lenders to come to you, or prefer to control the process yourself, you have a choice. Understand that mortgage comparison sites work differently. Some require more personal information. Some include estimated property taxes and homeowners insurance in your estimated payment. Others do not. Some, like The Mortgage Reports, feature helpful calculators to help you buy or refinance a house. At The Mortgage Reports, we even let you take your personal mortgage questions to our experts. With your privacy assured. One reason that shopping for a mortgage online makes sense is that you can obtain several quotes fast. Then, you may review them at home with no pressure. Ask the lenders you contact to provide a Loan Estimate. The government requires lenders to provide this when you apply for a home loan. However, you can ask for one when you’re comparing mortgages. The Loan Estimate form offers certain consumer protections that a simple worksheet does not. To create an accurate Loan Estimate, a lender needs several pieces of information. Otherwise, the quote is meaningless. They require your home value for a refinance. Or the sales price for a home purchase. Lenders also need to know how much you owe on your existing mortgage for a refinance, so they can calculate your loan-to-value. Or the size of your down payment, if you’re buying a house. And if your purchase will be a primary residence, vacation home or a rental. Finally, the type of house matters — condo, high-rise, duplex, manufactured home, etc. What about credit reports and social security numbers? You probably don’t want to give out your social security number to everyone when you’re not committed to a lender. However, mortgage lenders do need to know your credit rating to provide an accurate quote. Most price their loans in tiers. This means one rate for someone with a FICO score between 660 and 679, a lower rate for someone between 680 and 699. You can check your own credit for free, and get your FICO scores at a low cost from the major credit bureaus. The only site that provides these without obligation or selling your data is the government’s www.annualcreditreport.com. Give these scores to lenders when shopping for a loan, and don’t authorize credit reports until you are ready to apply. Credit inquiries subtract points from your score, and you don’t want to pull a report until you’re ready to apply. Understand, though, that the FICO scores you receive may be different from the one your lender gets when it pulls your history. There are many FICO versions, and the “educational” one for consumers may not be identical to the version your lender receives. However, they should be close. Finally, when you’ve applied for your loan and are ready to lock in your mortgage, it can’t hurt to quickly check competing rates again. Just to be sure that you’re getting the best deal available.